Khattu shyam Temple at Sikar in Rajasthan is dedicated to Sri Krishna and is based in the legend of Barbareek, the grandson of Bhima, the second of Pandava brothers. Khattu Shyam Temple festival and Mela 2019 date is March 16, March 17 and March 18. Another important festival is observed on June 13, 2019 - Nirjala Ekadasi day. 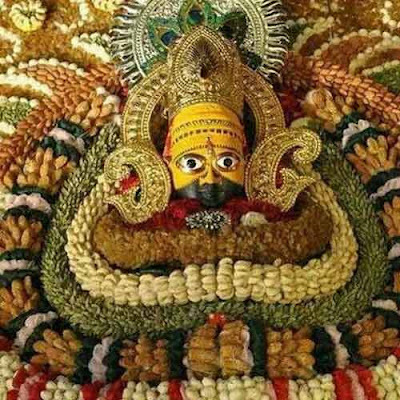 The festival which attracts more than 100,000 people is annually held during the Shukla Paksha Dasami, Ekadasi and Dwadashi of Phalgun month – from 10th to 11th day of waxing phase of moon in Falguna month. The fair and festival is held in memory of the sacrifice made by Barbareek – the powerful grandson of Bhima and son of Ghatothkacha who had to align with Kauravas. But Krishna did not want this to happen so he asked for the head of Barabareek. The young warrior immediately agreed to it. Krishna blessed Barbareek that in Kali yuga he will be worshipped just like Sri Krishna. Built around 1000 years ago, the temple is noted for its architecture. Paintings based on stories from Puranas and Epics adorn the walls of the temple. Thousands of people arrive from various states in India and also abroad to participate in the Phalgun Shukla Paksha Ekadasi festival. The temple is located around 65 km from Sikar and 80 km from Jaipur.